A: The fee ranges from $0 to $15 per bureau, meaning that it can cost upwards of $60 to place a freeze at all four credit bureaus (recommended). However, in most states, consumers can freeze their credit file for free at each of the major credit bureaus if they also supply a copy of a police report and in some cases an affidavit stating that the filer believes he/she is or is likely to be the victim of identity theft. In many states, that police report can be filed and obtained online. The fee covers a freeze as long as the consumer keeps it in place. Equifax has a decent breakdown of the state laws and freeze fees/requirements. Q: What’s involved in unfreezing my file? A: The easiest way to unfreeze your file for the purposes of gaining new credit is to spend a few minutes on the phone with the company from which you hope to gain the line of credit (or perhaps research the matter online) to see which credit bureau they rely upon for credit checks. It will most likely be one of the major bureaus. Once you know which bureau the creditor uses, contact that bureau either via phone or online and supply the PIN they gave you when you froze your credit file with them. The thawing process should not take more than 24 hours. A: Fraud alerts only last for 90 days, although you can renew them as often as you like. More importantly, while lenders and service providers are supposed to seek and obtain your approval before granting credit in your name if you have a fraud alert on your file, they’re not legally required to do this. A: It depends on your state. Some states allow bureaus to charge $5 for a temporary thaw or a lift on a freeze. However, even if you have to do this once or twice a year, the cost of doing so is almost certainly less than paying for a year’s worth of credit monitoring services. The Consumers Union has a handy state-by-state guide listing the freeze and unfreeze fees. A: Yes: Periodically order a free copy of your credit report. By law, each of the three major credit reporting bureaus must provide a free copy of your credit report each year — via a government-mandated site: annualcreditreport.com. The best way to take advantage of this right is to make a notation in your calendar to request a copy of your report every 120 days, to review the report and to report any inaccuracies or questionable entries when and if you spot them. Q: I’ve heard that tax refund fraud is a big deal now. Would having a fraud alert or security freeze prevent thieves from filing phony tax refund requests in my name with the states and with the Internal Revenue Service? A: Neither would stop thieves from fraudulently requesting a refund in your name. However, a freeze on your credit file would have prevented thieves from using the IRS’s own Web site to request a copy of your previous year’s tax transcript — a problem the IRS said led to tax fraud on 100,000 Americans this year and that prompted the agency to suspend online access to the information. For more information on what you can do to minimize your exposure to tax refund fraud, see this primer. A couple of years back, I was signed up for a credit monitoring service and had several unauthorized applications for credit filed in my name in rapid succession. Over a period of weeks, I fielded numerous calls from the credit monitoring firm, and spent many grueling hours on the phone with the firm’s technicians and with the banks that had been tricked into granting the credit — all in a bid to convince the latter that I had not in fact asked them for a new credit line. The banks in question insisted that I verify my identity by giving them all of my personal information that they didn’t already have, and I was indignant that they should have been that careful before opening the new fraudulent accounts. Needless to say, the experience was extremely frustrating and massively time-consuming. We eventually got that straightened out, but it took weeks. Not long after that episode, I decided to freeze my credit and that of my wife’s at all of the major bureaus. Turns out, I did that none too soon: A few weeks later, I broke a story about a credit card breach at nationwide beauty chain Sally Beauty, detailing how the cards stolen from Sally Beauty customers had wound up for sale on Rescator[dot]cc, the same fraud shop that had been principally responsible for selling cards stolen in the wake of the massive data breaches at Home Depot and Target. Rescator’s message to his customers urging them to steal my identity. In response to my reporting about him and his site, Rescator changed his site’s home page to a photoshopped picture of my driver’s license, and linked his customers (mostly identity thieves and credit card hustlers) to a full copy of my credit report along with links to dozens of sites where one can apply for instant credit. 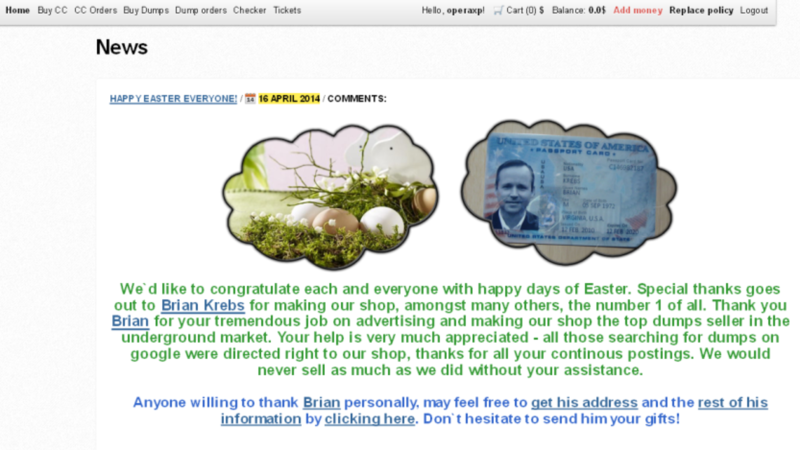 Rescator also encouraged his friends and customers to apply for new credit in my name. Over the next few weeks, I received multiple rejection letters from various financial firms, stating that although they had hoped to be able to grant my application for new credit, they were unable to do so because they could not view my credit file. The freeze had done its job. In summary, credit monitoring services are helpful in digging you out of an identity theft ditch. But if you want true piece of mind, freeze your credit file. This entry was posted on Monday, June 8th, 2015 at 1:47 am	and is filed under Security Tools. You can follow any comments to this entry through the RSS 2.0 feed. Both comments and pings are currently closed. Really appreciate the allusion to my work, thanks Mr Krebs!! This was a very helpful article in helping people manage identity theft. Keep up the great work. 1. Does putting a security freeze on your accounts have any impact on the credit scoring algorithm used by the bureaus? Obviously it is a net positive on the back side, but do the bureaus ding you at all for wanting to put the freeze in place? 2. What about kids? Should parents contact the bureaus to put a freeze on their kids credit as well? Is it the same process? 3. Is there any legislation around this at all which given the volume of data breached at this point everyone is in a bad guys database. Legislation which mandates a free credit freeze as part of data breach response? It seems that if a credit freeze on your accounts actually gave a bump in credit score, more people would be incentivized to do it, which then perhaps reduces overall fraud and costs associated. 1. No, no direct effect. Note that a credit score is a ballpark number how creditworthy you are. Whether you freeze something, place a fraude alert, etc should – and has – no effect on it as it doesn’t make you more or less creditworthy. 2. Kids are not allowed to have credit reports and hence cannot be frozen. I know ridiculous as the reverse should be true (always frozen), but that is the reality. 3. Yes, you can often have the $15 waved if you were a victim. Note that credit report companies obviously don’t like you to freeze your report. They live by the reports being accessible and your data sold. So they won’t ever incentify it. Last it *will* hamper (as typically in ‘completely block’) your ability to change phone companies, get a quote on car insurance, etc. Basicly all kinds of activities that are not directly ‘new credit’ related, but do require a company to check your credit. Just make sure you are aware of that! I can’t wait until the NSA and the IRS realize that they can also monetize their data collection activities by requiring us to pay to protect the data we never asked them to collect in the first place. Crazy? Can’t happen? This is exactly what all 4 credit bureaus do. This led me to think: The Rescator “Credit Bureau”, is a 5th never-asked for “credit bureau”. Payments are being made there too, just not for direct freeze “protection” that I’ve seen yet. Entrepreneurs already created 100’s more spam “credit bureaus” (“illegal-legal” business) putting more “personal information” into non-personal systems. These additional “credit bureaus” are existing online, just not with paid credit freeze “protection”, instead they only offer the “credit bureau” service of selling what’s in their “credit bureau” database. 1) Before you get a credit freeze, sign up for the Social Security Administration’s “My Social Security” Account. The reason? You will have to unfreeze your Equifax (I think) report before you can sign up if you do it after. And you’ll probably want to have access to this site to review your Social Security ballances, etc. So why not head over there now and sign up before someone else signs you up? They also have 2 factor authentication using a cell phone, I’d sign up for that two. 3). It’s clear to me that there is a concerted effort to scare people away from Credit Freezes and push them towards the montly/annual “we’ll keep an eye on your credit for you” plans. Don’t fall for it. Getting a security freeze is like requiring a PIN on your ATM card. If someone tells you that you don’t want to do that because it will make life ‘complicated’, they’re either an idiot or they’re lying to you. Yes, Mike, I just tried over at Equifax, and to lock your report, they steer you towards “Credit report monitoring” for $19.95/month. It appears you cannot create an account without doing that. This must be a way around this, or I’m just missing it (could be). I find it interesting that credit bureau’s hold your information and charge you to not release it. Sounds like blackmail. Three out of four bureaus took a total of 10 minutes (not each.. totally!). With a little help from Roboform it was a piece of cake until I got to Transunion. PIA. Would not work online (the only one I had to create an account to get through the process) and would not work in the automation on the phone. I’m now on hold with a person who is verifying what the other three verified in about 30 seconds. Thinking my Transunion listing had some problems so maybe it was worth the exercise just to have that done. I’ll sleep better knowing this is done. Again, thanks. It seems to me that *frozen* should be the *default* state of your credit report. Any time an inquiry comes in for my credit information, it should be the credit bureau’s responsibility to contact me for authorization to release my personal information to a specific party, for a specific purpose. I shouldn’t have to take any action to prevent them from doing so, and I certainly shouldn’t have to *pay* for it. It should be that way by default. It is completely insane for the process to work any other way. Write to your congressmen. I have, but they need to hear this from more than just me. Nice article Brian… Do you have any advice or pointers for us Canadians though since our laws and credit agencies are most likely different than the US? I froze my account and my wife’s account immediately after concluding NOTHING would stop these creeps from getting our identity. We do not need credit at this point in our lives….. even if we did we would freeze our accounts. Our son needs credit bureau activity more than us for work or mortgage purposes so we slammed a credit alert on his name renewable every 60 days for 90 days coverage. Just reapply like a new comer to reactivate…. the renewel process make you think you need a police report for a 7 year alert. Nonsense. Just reapply like you did 60-90 days ago. Mark your calender to re-up for another 90 days for the credit alert. By far the most peace of mind for us was the CREDIT FREEZE. You can always lift it on-line though it will cost you 10-15 dollars usually. Thanks for your work Krebs! I feel mislead believing I have to pay to be protected when a company gets hacked. I think these credit protectors “lifelock”and others do next to nothing to collect your money. Has anyone known someone where they are notified that their credit has been breeched? My C/C company does this for free. Great information, thank you so much for providing it all. I have had my debit/credit card number stolen 4 times in 8 months, thank goodness my bank put a fraud notice on my account so when someone from another state/country try to use it, they decline it. Getting back to the three major agencies and the 4th and 5th ones that many are not aware of, can a fraudster pick Innovis to set up stolen accounts without going to the major three that one may have frozen? I sent this question to Consumer Reports and they said to ask the big three. It is not easy to contact those people. It seems a new one could pop up without most families finding out. Excellent advice! It is the case the dealing with a new credit application, requiring a temporary unfreeze, can be a kind of clown circus with the bank. My bank doesn’t understand freeze, requires all 3 credit agencies to be unfrozen, makes repeated requests for the same access, then adds my spouse to the request, and finally loses all the information retrieved so far. Assuming you don’t often do a new credit application, is still a very wise step, to freeze your credit reporting! I thought there were 3 credit bureaus…you referred to 4 bureaus. Could you list the 4. I froze info at 3 but I guess I’m still vulnerable. The answer to your question is in the earliest comments. I found it in the article not the comments section. FRank, that information is in the main body of the story. The fourth bureau is Innovis. who is innovis? who uses them? are they big? do they really matter? when did they become a credit bureau? sorry for the dumb questions, but years ago in 2008, have had my credit record frozen with the big three (equifax, transunion, experian). the general info back then said to do freezes at the big three. now there is a fourth? ugh. so that’s an unfrozen hole that crooks can get through applying for credit at companies that use innovis to check people’s unfrozen credit reports. I didn’t wade through all the comments so the following may have been mentioned by someone. If you have a credit freeze on your file and are applying for credit, you can request a temporary lift and pay a one time fee. I read the Equifax link you referenced and my state (Missouri) has free freezes if I supply a police report of identity theft. But in the description, they talk about “…the unlawful use of your personal information by another person”. I have had my data compromised in one of the health care breaches but the data has not yet been used fradulently. Will that still qualify for free or would I have to have actually had someone open an account with my identity first? Brian, Thanks so much for the information. I was unaware of Innovis, but had put a freeze on the other 3 several months ago. I immediately put a freeze with Innovis. Thanks again. I and many others appreciate the hard work you put in for our benefit. 1) Lots of government agencies use Experian or another credit agency to validate requests. The IRS and SSN refuse attempts to open accounts if a credit freeze is in place. 2) Credit freezes can be temporarily lifted for a set period of time, often three or seven days, for a price, usually $10. 3) One must ask a business which credit agency it uses to ensure that the proper freeze is lifted. But my question above is where the crook goes only to Innovis where one did not freeze due to not having heard about them and bypasses the big three which do have freezes? Could ID theft be done that way? Er…I think all three of those things were addressed in my story, if you read the whole thing. 2) You mentioned that *placing* a credit freeze will incur a charge, but not temporarily removing it. I found the exact opposite to be true, with initiations being free and temporary removals costing $10. State law may have something to do with it. 3) This you did mention. Thank you for posting this. My husband and I were notified last week that we were of the 100,000 who had their tax returns stolen. While the IRS confirmed five years of our returns were downloaded, they only offer the credit monitoring. As we go through the long process of getting new everything, we were thinking of the seven year fraud alert but will definitely now go with the security freeze. It will be worth any fees we pay to do so. There is no link to the primer on identity theft protection services where it say’s ‘Click here’. Without denigrating in the least the good recommendations about credit freezes, people should be aware that freezing credit does not prevent the unauthorized use of stolen credit card information to charge purchases to that stolen account– that’s not an attempt to secure new credit. A freeze does prevent the use of the information to create a new credit card or other line of credit. But if the bad guys have your credit card info, say Chase Visa, they can go ahead and use that Visa account until you or Chase figure out the use was unauthorized and cancel the account, notwithstanding that you have set up credit freezes with all 4 agencies. You still have to check your bank’s website to monitor your credit card transactions fastidiously. what about protecting the future credit files of children? Any thoughts Brian? correct me if I’m wrong, that did not stop fraudsters from using SSN of children in their attempts to steal their IDs. It is possible with some of the bureaus to lift a freeze temporarily (1 day, 1 week, or 1 month) for purposes of seeking new credit but not having to worry about re-setting the freeze. With some it is also possible to get one-time-use PINs to give to a creditor. When they run in to the freeze, they enter that PIN (or your regular PIN, if you share it with them) directly and they can then pull your report instantly from a back-end system. No need to wait a day. So, I’ve been able to put a freeze on credit at 3 or the 4 agencies..after multiple attempts the past few days, Experian “can’t verify my identity” and wants me to mail documents in…I don’t think so. What are your thoughts on PRBC? Good to put a security freeze on there too? That company is a new one formed to help consumers build non debt related payment history. Since it isn’t debt related, I’m not sure how it would help to freeze something like that. I’m not even sure they could detect someone renting an apartment in your name.